RiftStar Raiders takes a unique approach to the shoot ’em up genre. As a mercenary for the titular organization, your job is to fight back against the Warswarm armada while recovering plentiful loot to bring to your base at Arcadia. Developer Climax Studios has embellished this twin stick shooter with loot collection, item progression, and vast levels to explore. This is not your daddy’s Asteroids. Imagine a mix of that arcade oldie with the co-operative dependency of Gauntlet, the loot collection of Diablo, and a seeming inspiration from the Dreamcast cult classic Armada, including that arcade-era of difficulty. 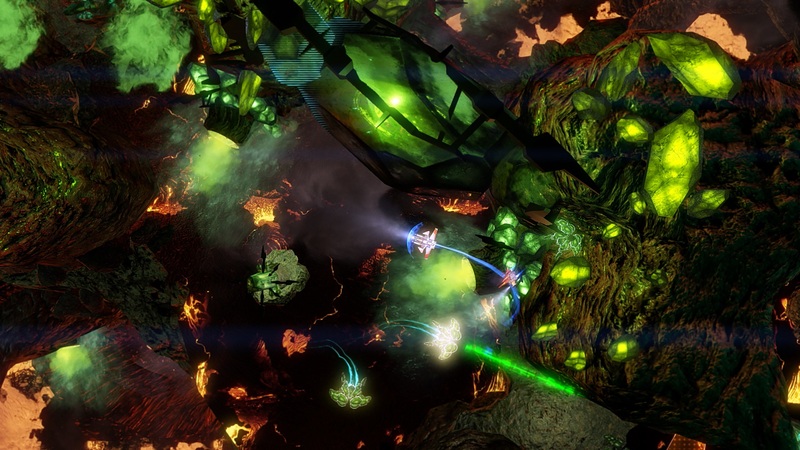 RiftStar Raiders is neither an on-rails or a forward scrolling twin stick shooter. Rather, levels take place across giant canvases to explore, like side-view dungeons with hidden nooks and crannies off the beaten path. Enemy skirmishes are fast, intense, and hard-hitting, and having a radar on screen to indicate the relative distance of enemy ships comes in very handy. The pace flows slowly with bursts of fast action. Missions aren’t all about shooting up ships, though. Variety comes aplenty across the game’s nine missions. You might be deactivating giant space batteries, hacking gates, or escorting cargo across mine fields at any given moment. No matter the cause, all these missions cap with a boss battle that requires more strategy than simple shooting. 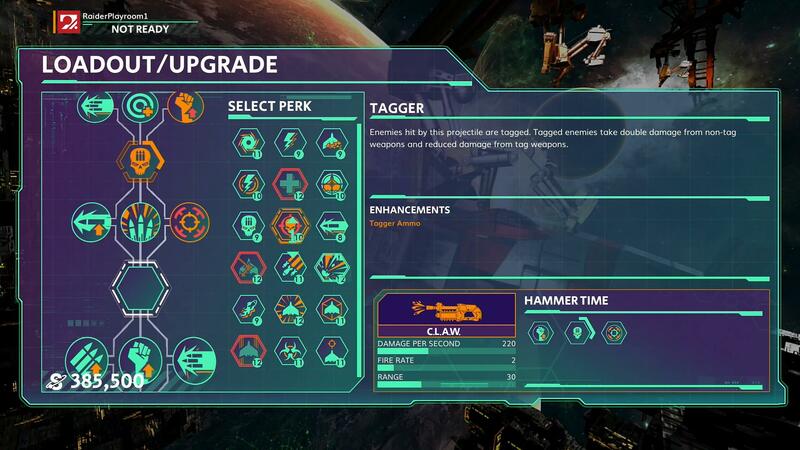 Arcadia is not only a guise for the main menu, but it is chiefly your key to upgrading your ship. Your starting ship looks like a tiny Vic Viper, but you can purchase more designs as you progress. Multiple types of guns and shields give you a multitude of options to fit your preferred play style. Each of these can be equipped with buffs that you’ll purchase and equip. These include skills that buff your bullet spray, increase your boost speed, or up your defensive stats and increase the speed of your regenerative health. It would be nice if you could “test” the various purchases before checking out, but alas. The tech tree system of customizations opens up many possibilities for experimentation and multiple playthroughs. 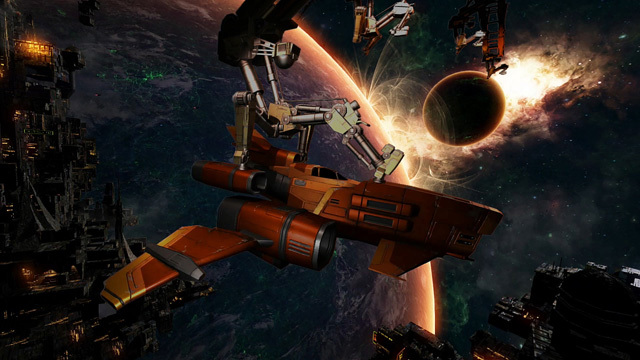 Upgrading your ship is the key to survival in RiftStar Raiders. The game can be insanely difficult. Enemies seem highly buffed against your firepower even with upgrades, and when they spawn in high numbers, your ship will crumble quickly. There are regular checkpoints scattered throughout, but each level can be War and Peace-length, and when you game over, you’ll have to start missions all over again. It gets so overwhelmingly difficult that it’s not fun anymore. In fact, your best bet for collecting loot is to clear the immediate area of enemy fighters and turret guns first and foremost. This is true when you’re flying solo, but it’s possible that with four players, the action becomes more manageable, which I was not able to test in the review process. If you’re expecting this contemporary shooter to show some mercy, Climax Studios is afraid that it’s grown cold to your pleas of mercy. At least there are options to increase the number of ships (re: lives) you have (like the dipswitches on an arcade board). It takes you a while to find your bearings, too. Ship control is very floaty and can be tough to come to grips with. The game tries to mitigate this with multiple control options. Virtually every button on your controller does something different, and those buttons can combine for greater ship control, offering a layered degree of manipulating your vessel. Take this early scenario: in the tutorial level (Event 0), I kept on dying over and over in the same mine field, trying to sneak through without triggering an explosion that would insta-kill me. It took multiple retries to discover that using both analog sticks will mitigate the problem slightly, and it took me yet more tries to complete the section before breathing a massive sigh of relief. It can be annoying, but you may personally enjoy the nuance and depth. RiftStar Raiders‘ visual style is very sharp and clean, with levels showcasing a suitable degree of variety and color, and everything in the environments resembling hyper-detailed miniature models. Enemy space ships have enough distinction to differentiate them, important for reacting in combat. The only issue with the miniature approach is when a zone is so dark, it obscures hidden guns and enemy spawn points in the environment, all of which must be destroyed. The sound design itself is a most unorthodox combination. While sound effects suit the futuristic space environment, the music is not the typical space sound; it’s more akin to post-apocalyptic road stories in America which have a very un-space-like identity, if that makes any sense. Aside from the aforementioned difficulty curve, arguably the biggest blow to RiftStar is the lack of a pause function. There’s absolutely no way to pause, only open up a sub-menu. The action still goes on with this menu open, a huge problem that many other games without a pause function have demonstrated in recent years. Having reviewed this title on PS4, even going to the home menu doesn’t really pause the action. God help you if you have to take a (bathroom) break or make a cup of coffee, because you might be dead (in-game) by the time you get back. It seems to be a design choice based on the online leaderboard-driven nature of the game, requiring a constant internet connection to keep track of your progress for the purpose of score-keeping. That makes sense pragmatically, but it’s not a favorable design decision. RiftStar Raiders has a lot of neat ideas on how to expand on the scrolling shooter with its penchant for upgradeable ships and densely packed levels. The difficulty gets in the way of that fun, however, and it’s not just because it’s a space shooter. 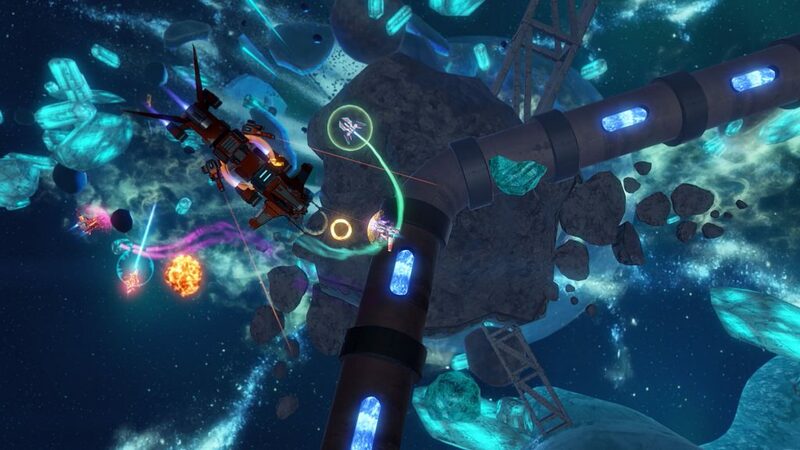 Challenge should be handed out at a fairly steady clip, but RiftStar Raiders is punishing from the very first level. If replay value is your thing, then you’ll be kept busy for a good while replaying these nine levels for new high scores and farming currency to power up your ship. It’s clearly built for co-op, which would explain away the overwhelming odds you face in solo play. You’ll be kept plenty busy with the progression loop, but you’ll want to check yourself before you wreck yourself should the game’s high octane challenge be worth your time.